Sometimes the best ideas for lessons come straight from my students. 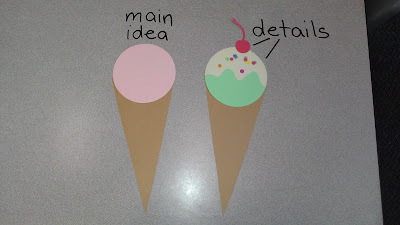 I started a reading challenge this month called "Get the Scoop on Reading"--basically, for every chapter book my students read, they will get to add one paper ice cream scoop to an ice cream sundae display in the classroom. (More to follow on that when the challenge is finished and I can post a picture of the final display.) I was telling some of my students about the challenge and pointed out the poster I had made giving the details of the challenge. 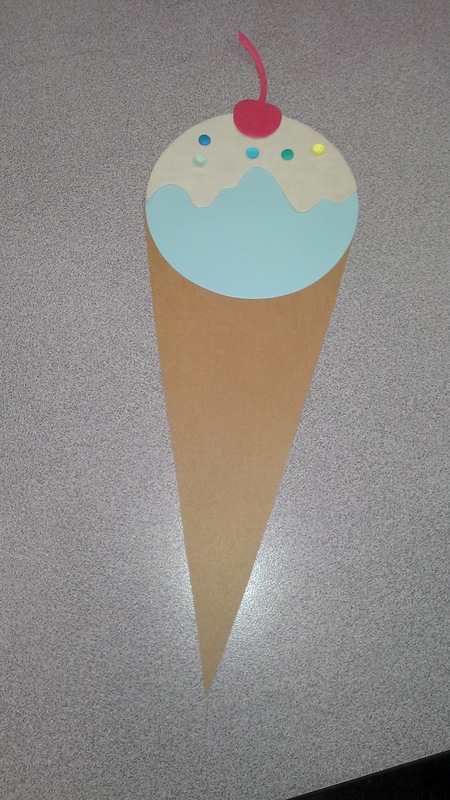 On the poster I had included a paper ice cream cone, and one of my students asked me if they could make ice cream cones that day for fun. In about the time it took me to tell him "Not today" I suddenly formulated this entire lesson in my mind. I started thinking about how an ice cream cone could be like the main idea, while the toppings are like the details. We've covered the concept of main idea and details before, but we're due for a review, especially with testing coming up in a few weeks. Next week, I'm going to set up a "sundae" bar for my students. We will review the concept of main idea and details, and then read a book or article together. After reading, I will give each student a graphic organizer with a box in the middle for the main idea, and some smaller boxes for details. Students will independently fill in the graphic organizer; as they fill in each box, they will earn pieces for their ice cream cones. When they have correctly filled in the main idea, they earn their cone and can pick a scoop of ice cream to add to it. Then, for each detail they add, they can earn a topping. I made whipped cream, sprinkles, and cherries. The prep time on this was actually pretty quick. I used die-cuts for nearly everything. The ice cream scoops are just circle die-cuts. I used the same circle die-cut for the whipped cream, and just cut them in half with a wavy line. The sprinkles are hole-punches. 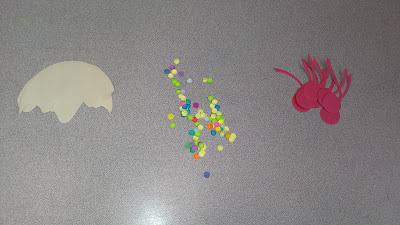 I raided the workroom hole-punch for those; it was a win-win because I got my "sprinkles" and they got their hole-punch cleaned out. :) The cherries were also a die-cut, meaning that the only thing I really had to cut out were the cones, which was very quick. They look pretty cute when they're done, and I know the students will have a great time putting them together. I'm looking forward to telling my one student that I based this lesson on his idea. This is just the something I need. 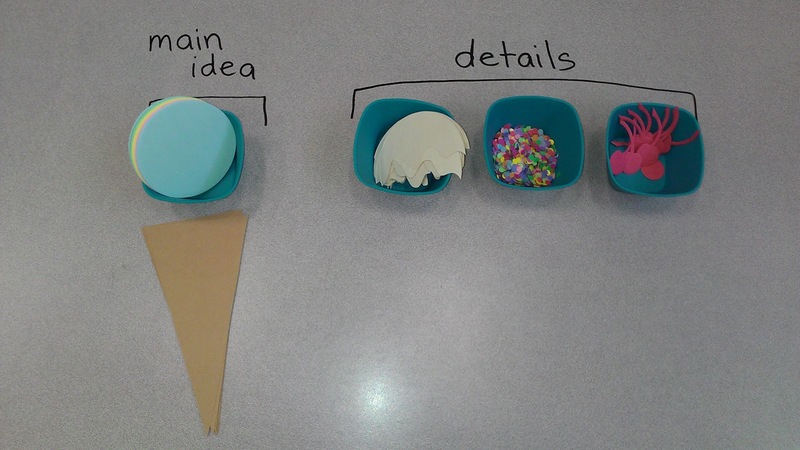 Over the next few weeks our reading strategy will be main idea and details. My students love doing hands-on while learning and this is a great idea. Thanks! I'm so glad you found this idea helpful! I hope your students love it as much as mine did! This is really very informative and nice post. The activity that you have mention through this post is really very good. I will try this at home with my kiddos.